In May 2009, I visited Mesquite, Nevada and wrote about my experiences there. At the time, the U.S. appeared to be at the depths of its Great Recession. In the previous decade, the population of Mesquite had ballooned, from 9,000 to a reported 19,000. By 2009, it was on its way back down to a 2010 U.S. Census figure of 15,000. Although a Wal-Mart and other new shopping venues arose in North Mesquite, business activity south of Interstate I-15 on West Mesquite Blvd. looked anemic, at best. By 2009, at least one major golf course had closed and two major hotel/casinos stood empty. Mormon settles founded the old town of Mesquite, Nevada in 1880. By the 1960’s, Mesquite had become the largest town between Las Vegas and St. George, Utah, to the north. Although that stretch of Interstate Highway was complete by 1967, business-friendly politicians thwarted the I-15 bypass of Mesquite until scandalously late, in 1973. Until then, travelers endured a forced exit from the freeway at Mesquite. Whether they were ready for a break or not, an old-fashioned drive along West Mesquite Blvd. was part of the early I-15 travel experience. After I-15 opened at Mesquite, the town no longer had a captive motoring audience. On the new freeway, it was a quick 122-mile trip between Las Vegas and St. George, Utah. Ever inventive, residents of the largely Mormon town did what they could to survive. First with legal gambling and later with master planned retirement communities, Mesquite attracted new residents and businesses. Almost any desert town will see cycles of boom and bust. After the boom peaked in 2007, there was an accelerating pace of economic decline in what once was known as “Mesquite Flats”. Now, in 2012, it was time to make another assessment of the Mesquite, Nevada economy. Quickly I found that the economic message in Mesquite is mixed. Several planned communities in North Mesquite continue to grow, albeit much slower than before the 2007 peak. According to statistics, the recent unemployment rate in Mesquite was a whopping 13.3%, compared to the U.S. average of 9.1%. Some will prosper and some will fail, but the failure rate of South Mesquite businesses appears higher than in North Mesquite. On the old highway, I remembered a mattress store from before, but it was gone without a trace. Harley’s Garage and other iconic signs of Old U.S. Highway 91 stood empty, painted-over or crumbling. 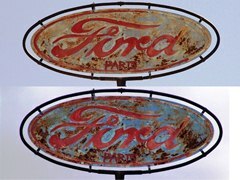 Even the Harley's Garage old hand painted "Ford Parts" sign had succumbed to rust. In 2009, The Ranch Market, with its attractive mission revival style building thrived. During my visit to the market, I had found remains of an old pole barn at the rear of the property. Perhaps the pole barn was Mesquite's original ranch market. Although the barn appeared built nearly a century ago, its well trussed structure and a loose collection of roof boards remained intact. On my 2012 visit, The Ranch Market was closed. If such a nice market could not prosper in old Mesquite, I reasoned that the local economy still suffered. In the 2006 Disney Pixar movie Cars, the loveable tow truck known as “Tow Mater” slept in a dilapidated barn or shed. Having recently watched the movie, I wanted to see how much the old Ranch Market Pole Barn might resemble Mater’s lair. After all, the Wigwam Village motel in Holbrook, Arizona rode to fame as the Cozy Cone Motel in the movie Cars. In the 1960’s, Interstate I-40 bypassed Seligman, Arizona. That old U.S. Route-66 town later became the model for Radiator Springs in the movie Cars. Today, the bypass of Seligman makes it a nostalgic detour from the sterile I-40. If highway nostalgia worked in Arizona, why not consider it in Mesquite, Nevada? When I took a closer look at the Ranch Market Pole Barn, I saw that it was at least a spiritual match with Tow Mater’s abode. Today, Mesquite, Nevada cries out for economic development. Not unlike the economy of Mesquite Flats, the old pole barn appears ready to collapse of its own weight. A good first step would be to buy a rusted-out old tow truck, paint eyes on the windshield and park it in the old pole barn. Maybe it will never be another Seligman, but if Mesquite does not preserve its precious relics, its storied past will fade away.